Power Supply Approvals UL Listed – The power supply of FakeTV is UL listed, which means it has passed rigorous safety testing. The FakeTV unit itself uses only safe, low voltage (9V) power and is connected to a UL listed supply, and thus requires no further approval. The UL listing for the FakeTV power supply meets the Canadian requirements as well. Additionally, power supply has been tested for conformity to EU standards appropriate for the markets in which they are sold. We have used power supplies from several manufacturers, and these are some of the certifications. 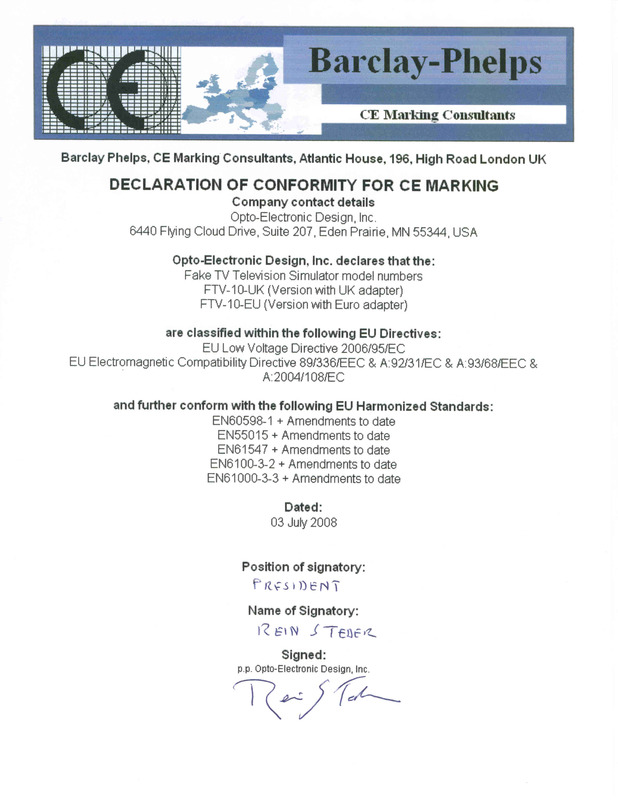 CE Marked FakeTV is CE marked, which means that it complies with the applicable European safety standards. 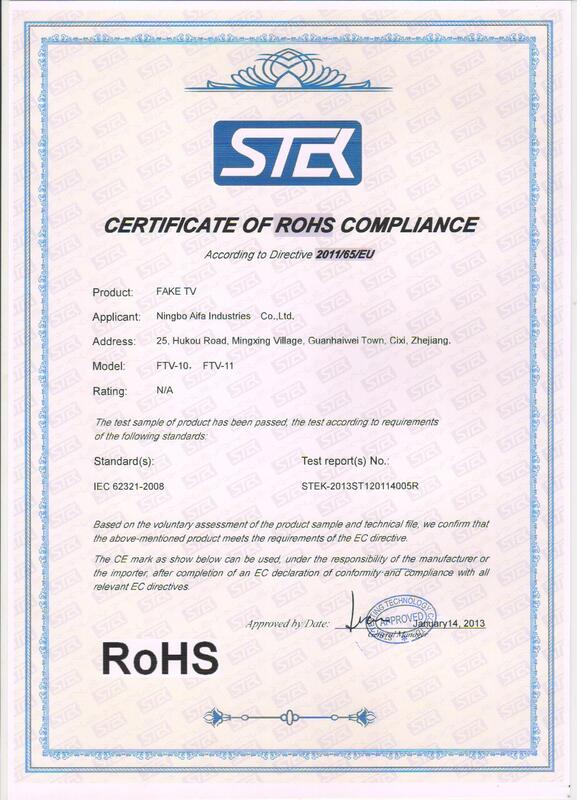 RoHS Compliant FakeTV is RoHS (Reduction of Hazardous Substances) compliant. This means that it will not leave nasty chemicals in a landfill. 7,365,649, 7,719,435, 7,755,470 An international (PCT) application is pending. Do not make counterfeit copies of our product, or otherwise practice the inventions claimed in the above patents. US law allow for treble (i.e. three times) damages in cases where patent violation is willful. You might wish to consult your attorney on how much piracy could cost you. Do not use our registered trademark (FakeTV) or confusingly similar variations thereof. Your actual results will usually be a bit better than we indicate in our specifications. Real televisions vary widely in light output. Older CRTs televisions will typically be just a bit dimmer than the “typical television” we are referencing. LCD televisions that are just a few years old, and current lower-end televisions, are back-lit with fluorescent lamps, and are considerably dimmer. But, most newer televisions have LED back-lights, and are typically about as bright as the FakeTV’s they correspond to in our specifications. But, you will typically aim the FakeTV directly at the window coverings, while the television is aimed at the couch. So, while we say an FTV-10 is equivalent to a 27 inch television, an FTV-10, when viewed from outside will likely be a bit more noticeable than a 27 inch operating television in the room. We provide the equivalent of simulated size so that you can make an informed purchasing decision. It is our best, good-faith estimate of what you can expect under real conditions. Our measurements are assuming the reference television is displaying real program content, not test patterns. Also, brightness levels are typical, not guaranteed limits of operation. Our specification is not overly optimistic. It s not a “your actual mileage may vary if you insist on being in the car when you are driving it” sort of thing. We measured a “60W incandescent equivalent CFL”, for example, and found it to be 18% percent less bright than a real 60W incandescent bulb. That’s just plain wrong. It’s like paying for a pound of cheese and getting 13 oz. When we say that the FTV-11 is equivalent to a real 40″ television, we mean that it will really look as bright as typical 40″ television when viewed from outside the home. Received my 2 FakeTV's, have used them and absolutely LOVE them. This is such a brilliant idea & wish I'd found your website sooner! Thanks so much for the fast ship! Have told family and friends about your website and product. …replicates a television's flickering light in all its dynamic variety, from kinetic commercials to subdued news reports. I just received my FakeTV order yesterday & I love it ! It’s ingenious…it exactly replicates the visual emission patterns & light intensity of a real TV. I must admit I was somewhat entranced by its unpredictable changes of color & intensity – sometimes slowly & smoothly, other times quickly & abruptly. I am very pleased with this product & am glad I bought it – it performs exactly as advertised. FakeTV is one of those devices you wonder “why didn’t they think of that sooner”? It gives the impression of a lived in residence by replicating the presence of an occupant watching television.